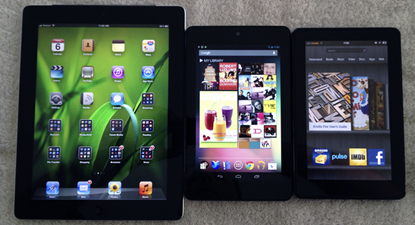 Choosing the Right Tablet PC - iPad, Samsung Galaxy, Google Nexus or even Kindle? Choosing the Right Tablet PC – iPad, Samsung Galaxy, Google Nexus or even Kindle? Home » Gadgets » Choosing the Right Tablet PC – iPad, Samsung Galaxy, Google Nexus or even Kindle? With so many tablet computers on the market, knowing which one to choose is something of a challenge. You may have your heart set on a stylish iPad or even one of the latest Samsung Galaxy Tabs, or perhaps you simply want a tablet that does the basics without worrying too much about fancy features. You may use your tablet for work, home or even just for the odd meetings or games. Choosing a tablet is a lot simpler when you know how you plan to use it the most. Once you have decided which features you want, you can narrow down your choices and make your final decision based on the features that the tablet provides. Which Tablet Features Do You Need the Most? · Tablets with high quality movie players will give you a better picture and sound for entertainment. Larger screens are also better for movies compared to small screens of course. · Tablets that have a good battery life are important if you plan to use your tablet in meetings or during travels. You should also be able to charge your tablet quickly and easily from a wall adapter or USB adapter. · Tablets used for work should support decent applications. Android tablets for instance give you access to the Google Play store, while iPads will allow you to look for free and paid office applications on the iTunes store. · Durable, tough tablets are best if you plan to let your kids use your tablet, although the majority of tablets are child-friendly. With many educational games, both Android and iPad provide a range of applications for children. · If you simply want a basic tablet that allows you to check email, do a bit of browsing and play the odd game, then you can choose something more affordable rather than going with the added features of more advanced tablets. · Always make sure however that your tablet has a full warranty and that it has received positive reviews. Do a bit of research to see which have good feedback, and don’t be shy to ask friends what they would suggest. Your tablet is the perfect go-between option to use alongside your smartphone and computer, helping you take your work with you and access movies, games, ebooks, photos, music and just about any other file on the go. Choosing the tablet that is just right for your needs will ensure that you make the most from your tablet. With tablets becoming smaller in size, will Smartphones lose their market share? Is Getting a Small Tablet PC Worth the Investment? and can harm your high quality score if advertising and marketing with Adwords. look out for much extra of your respective exciting content. Ensure that you replace this once more soon.. I simply want to say I am just all new to blogs and absolutely savored your page. Likely I’m going to bookmark your blog . You surely come with amazing well written articles. Cheers for sharing your web site.